Scrambling can be one of the most satisfying ways of getting to the top of a mountain. It covers the area between mountain walking & rock climbing. It generally involves covering steep, broken, rocky ground and occasionally more sustained rock steps. Lupine Adventure can give you an introduction to scrambling. We offer scrambling courses and scrambling taster sessions in and around Snowdonia, North Wales where locally based, fully qualified instructors have a vast knowledge of the routes involved, though courses can be offered elsewhere by arrangement. Scrambling is usually graded from 1-3*. Grade 1 Scrambles don't usually require the use of a rope, but may require careful route-finding and good mountain sense. These can be a fine introduction to mountaineering and give amazing and memorable days out. Lupine Instructors can guide you through such terrain, looking at the issues involved in having a safe day out and will have the necessary equipment & training to help you overcome obstacles should nerves get the better of you. 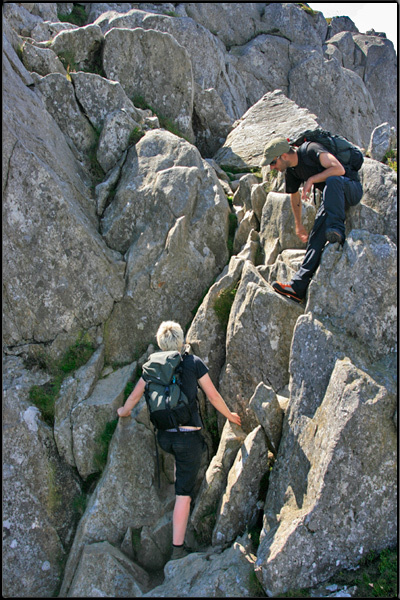 Many people know of classic scrambling routes in North Wales, such as the notorious Crib Goch, Tryfan's North Ridge or the Snowdon Horseshoe. Our instructors can lead you on a route of your choice, whatever the grade, looking after you as you go, whilst informing and answering your questions on a wide range of mountain related subjects. Grade 2, 3 & 3* Scrambles are considerably more serious & even the very experienced may require a rope. Grade 3* scrambles often have pitches of graded climbing and grade 3/3* scrambles often appear as routes in climbing guide books. Lupine can provide guiding on such scrambles for those who want a serious mountaineering challenge. These courses will run on a ratio of 2 or 3 clients to 1 Instructor dependent on the route choice and previous experience of group members. Advanced Scrambling Courses Provide instruction in how to protect and enjoy mountaineering challenges such as grade 3/3* scrambles for those with a good degree of prior experience on easier routes. This type of Mountaineering course will cover many of the same skills as advanced climbing courses, such as gear selection, gear placements, ropework, route finding, movement on rock and guide book interpretation. Such courses will run on a 2:1 basis due to the seriousness of routes involved and the level of instruction required. Advanced scrambling courses will be a minimum of 2 days in length, though 3 or even four days is recommended dependent on prior experience as the it covers a wide variety of ropework & techniques. Typical prices for scrambling courses would be around £160 per day for grade 1 scrambles or courses with a ratio of 2:1 and £200 per day for course with a ratio of 3:1, discounts are available for those booking multiple days.